Northern Lights XL Bulk Seeds: Crazy Yields, Superb Aroma and Excellent High! 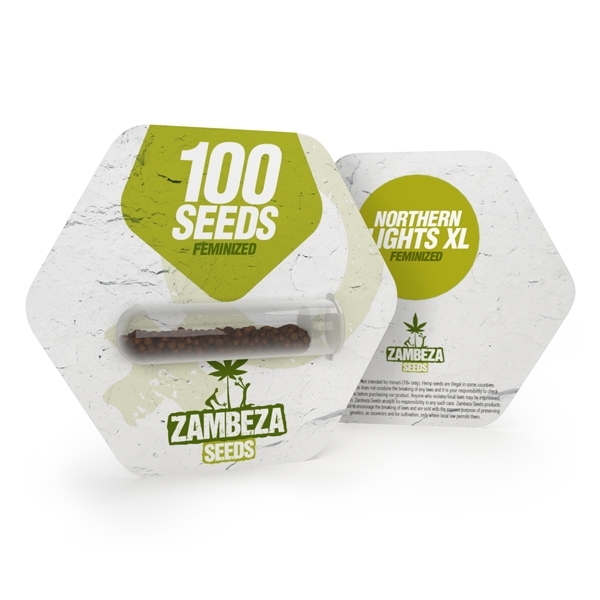 Zambeza managed to enhance one of the most popular strains even further by giving the famed Northern Lights their XL treatment. This variety shines with even higher yields while keeping the superb old-school flavour of the original. The cross between a Northern Lights and an Afghani, results in a fabulous indica that shines with an extraordinary short flowering time of only 60 days where she can bring a whopping up to 750g/m² of heavy bud to the table. Because of her outright insane production and fast turnover, Northern Lights XL is ideal for cash croppers who want a reliable plant where they can look forward to big yields of XL-sized buds no matter their growing experience. Northern Lights is an easy-growing plant that you can grow virtually everywhere which means that even new cannabis growers can look forward to some good results. Outdoors, in ideal conditions and with plenty of sun she’ll grow up to 230cm where she can yield 550-650g per plant. If you grow Northern Lights XL indoors under a 600W light you can expect 600-750g/m² and her height will normally reach 120-150cm. What smokers will love about Northern Lights XL is her flavour that makes her a favourite especially among old-school cannabis enthusiasts: Like the untainted original Northern Lights, she delights with a superb blend of sweet and fresh citrus aromas that will make you crave more with every hit. When it comes to her potency, Northern Light XL again shows why she is among the most popular strains today: With a high THC content of 19% you will only need a hit or two and you will feel her incredibly powerful effect that is just the right mix of a deeply relaxing stone with endless waves of happiness! Northern Lights XL is a strain that can be recommended without hesitation. Just ask all the seasoned cannabis growers and beginners alike who love growing her because of her crazy production, superb aroma and high! Northern Lights XL Bulks Seeds is available in packs of 100 seeds.